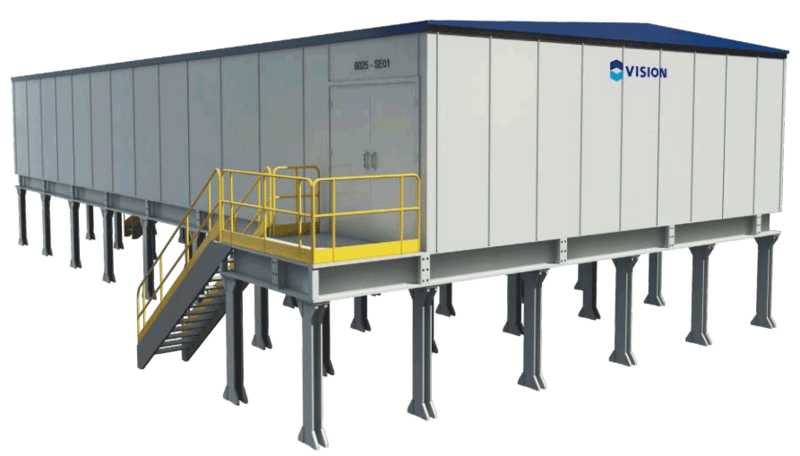 The VISION Group E-House is a modular electrical room and caters to the needs of applications in substations and industrial plants and offer reduced delivery times and elimination of field work. Besides being delivered turnkey (factory tested), the E-House integrates the functionalities of control, monitoring and data acquisition substation. You can integrate VISION E-House the control room and battery room. The first can be separated or not the panels room with operator stations / maintenance, rack and TA, PLCs, etc., allowing operation in stand-alone basis. Normally the E-House comes with QDMT, MV / LV transformer, low voltage switchboard, MCCs, PLC, internal and external lighting distribution board, uninterruptible voltage system, transformers and lighting tools, HVAC systems and emergency (detection, alarm and fire Fighting). Supervision of protection relays, transformers, circuit breakers, disconnectors and battery bank. Variety of protocols – IEC 61850, DNP3.0 IEC-60870-103. Possibility of using the IEC61850 Process Bus and all its benefits.